Long before the cat held great meaning for the Celts, it was revered by the Ancients Egyptians. For the Ancient Egyptians, the Goddess Bastet looked like a lioness. Over time, Egyptian beliefs changed and Bastet took on the appearance of a house cat, tying her closely to the Ancient Egyptians worship of cats. The Ancient Egyptians taught the Ancient Romans about the symbolic meaning of the cat. The Romans taught the Celts. Thus, when you look at the Celtic Cat meaning you see elements of Ancient Egyptian beliefs and mythology. The Ancient Celts considered cats to be guardians of the Otherworld (similar to the Ancient Egyptian Underworld). They kept the secrets of the Otherworld, never revealing their vast knowledge. Black cats were considered a sign of evil, and thus were sacrificed. The Celtic Cat meaning is one of resourcefulness, flexibility, aloofness, unpredictability, and mystery. To the Ancient Celts, cats were a message to step back and look within. Give yourself the distance and peace you need. Trust your intuition to guide you on the right path. Change up your routine and find ways you can be more creative and flexible. 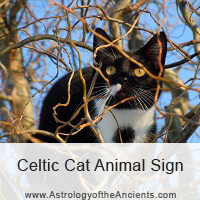 In astrology, the Celtic Cat zodiac sign represents fierce intelligence. Combining a highly analytical, fast thinking mind with a strong intuition, this Celtic zodiac sign has keen insight into any situation or project. While they don't crave attention, this zodiac sign is very lovable and charming. Highly communicative and expressive, you always know where you stand with a Celtic cat. Celtic Cat mythology tells of a cait sidhe (Ireland; also called a caith sith in Scotland). The cait sidhe wasn't a cat as we know it, but rather a fairy, witch or spirit creature that took on the form of a cat. It was a large, fearsome black cat creature with a spot of white on its chest. The cait sidhe had the power to steal souls from the dead. Thus, the ancient Celts would try to protect the body until burial to ensure the soul could pass to the gods. Celts would play games or wrestle to distract the cait sidhe, put out catnip to entice the cait sidhe away from the dead body, and play music and tell riddles (that they wouldn't answer) to entertain the cait sidhe. On the night of Samhain (Halloween), the Celts would leave a saucer of milk outside of their houses for the cait sidhe. If milk wasn't left out, when the cait sidhe visited a house, it would curse the owner's cows. These Celtic cat myths of the cait sidge have led to many traditional Western beliefs about cats, such as the connection between cats and witchcraft, in which cats may be a witch's familiar or a witch can transform into the shape of a cat. Black cats in particular, are associated with bad deeds, Halloween, and things that go bump in the night.